Yesterday was the 6th annual Fish Fry for the Friends of the North Fork of the Shenandoah River. For the past 3 years we have enlisted local talent to help with the items for auction. 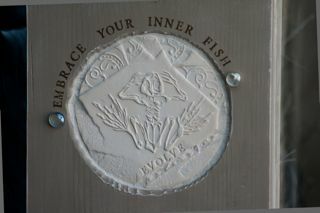 The first year we did terra cotta planters and had the artists do a creation of their River Vision. To see those you can click here. Last year we did floorcloths and this year we did wooden benches. You can see my entry below. My inspiration was based on the book by Neil Shubin Your Inner Fish: A Journey into the 3.5-Billion-Year History of the Human Body. 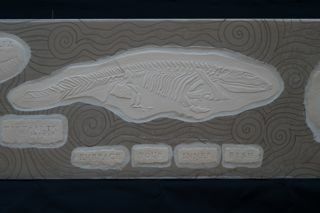 In 2004 Neil Shubin and his team of scientists discovered the tiktaalik roseae (the main fish in my bench) in Canada and this fish filled in a blank in the timeline as to when fish began to walk on land. This is the fish that we are related to. It has an elbow and before that no other creature had evolved a limb that would allow it to walk. To wrap your head around the fact that you could be related to a creature like this is just really fascinating. I am a firm believer in science and think that almost everything will eventually be proven through science if we just keep filling in the blanks. The bench is a combination materials–stoneware tiles, bamboo sticks, paper and wood. Stoneware tiles represent the fossils that Dr. Shubin and his team discovered in 2004. They are embedded in the bench because he found them embedded in the earth on Ellesmere Island in Nunavut, Canada. I also thought that using a frog would be a fun addi- tion given that frogs also have the elbows much like the Tiktaalik and we are familiar with frogs having elbows. One of the legs is printed with a timeline that shows the time periods that these creatures have gone through to get to us. 375 million years is a long time. 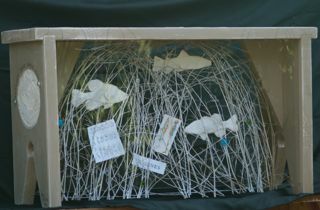 Between the bench legs an aquarium of sorts shows stoneware fish from our river (someday they may be fossils too) suspended with illustrations showing the similarities we have with fish embryos and the genes that we share. Some of the research is written on the seat area to give the background a texture and to also credit Dr. Shubin and his team for their great discovery. The bench is a combination materials–stoneware tiles, bamboo sticks, paper and wood. Stoneware tiles represent the fossils that Dr. Shubin and his team discovered in 2004. They are embedded in the bench because he found them embedded in the earth on Ellesmere Island in Nunavut, Canada. I also thought that using a frog would be a fun addi- tion given that frogs also have the elbows much like the Tiktaalik and we are familiar with frogs having elbows. One of the legs is printed with a timeline that shows the time periods that these creatures have gone through to get to us. 375 million years is a long time. Between the bench legs an aquarium of sorts shows stoneware fish from our river (someday they may be fossils too) suspended with illustrations showing the similarities we have with fish embryos and the genes that we share. Some of the research is written on the seat area to give the background a texture and to also credit Dr. Shubin and his team for their great discovery. So at the fish fry, we auctioned all the benches for the Shenandoah River and hopefully made the organization lots of money to continue their work to help educate people about things they can do to help clean up our river and better it’s health. To see the other benches that were auctioned, which were WONDERFUL, by the way, you can click here. There were probably about 180 folks who came to the fish fry and had a great meal provided by Shaffer’s Catering of Woodstock of catfish, hushpuppies, a sweet potatoe medley, spinach and mandarin orange salad, parsley potatoes, apple dumplings and hot apple cider. YUM! My favorite part of the bench was the frog skeleton that was in both the top and the side of the bench. You can see him in this photo. My bench sold for $1000 which was amazing! Susie Morgan Wilburn • This entry was posted in Ceramics, Friends of the North Fork of the Shenandoah River. Bookmark the permalink. Your skills amaze me as well. Can’t comment on your looking hot but will continue to admire and be inspired by your talent. Susie, GREAT for you and Friends. Wow, $1,000. That is amazing, hopefully the day turned out great. We really wanted to get by but it is just too hard on a Saturday to get away from the garden center.